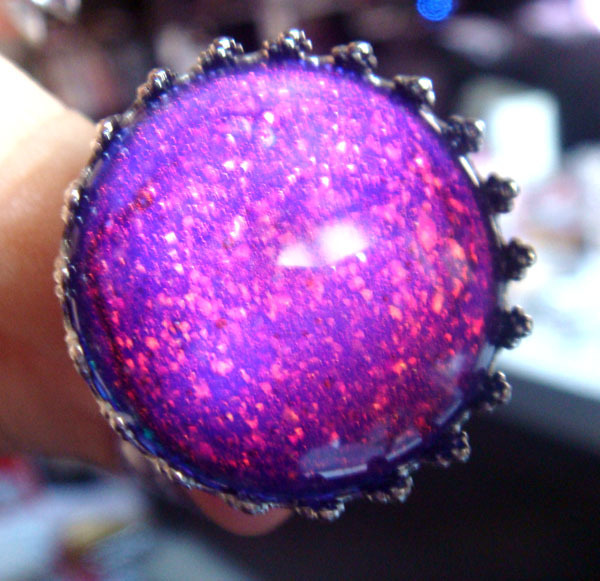 You can have your nail polish and wear it too! A new week is starting and I thought it was about time to share a new crafting idea since the deco part of my blog must have been feeling a bit left out lately. But with this post I will combine both deco and nail polish so yay!!! It all started after coming along this article in one of the nail polish mags I was reading in the summer. 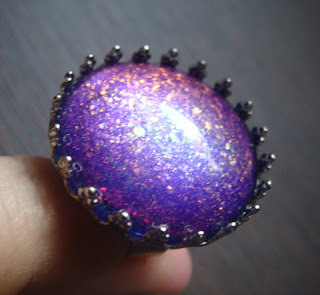 After showing a lovely design with white colours on a purple background the writer suggests making a matching ring using gel. Now I have never played with gel nails but the idea was stuck in my head. I was intrigued. So I started experimenting and investigating. Then I came across this lovely tutorial on youtube. 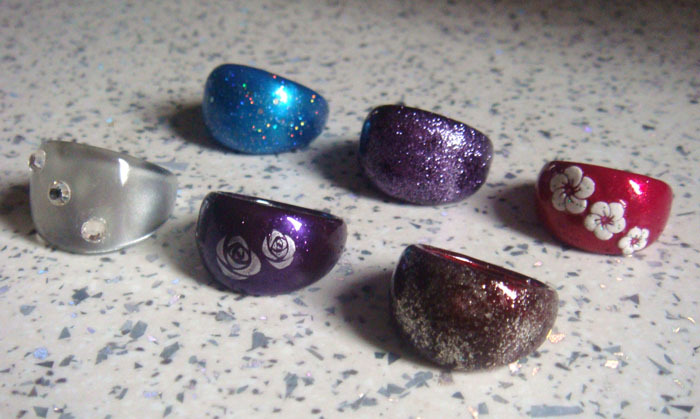 That was it, I started experimenting with all sorts of polishes and designs. I find the whole idea very exciting so here are some of my creations as well. Various designs. You can see I used glitter, nail decals, swarovski crystals, stamping and sponging. 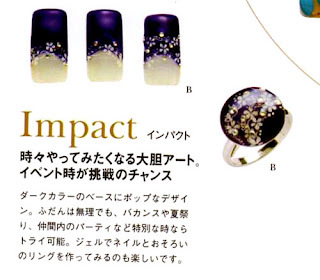 Rings with the matching manicure. 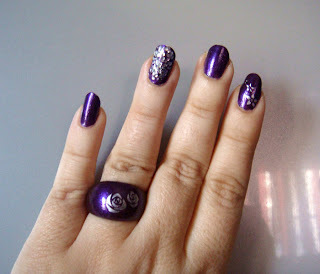 Rings using Zoya Sara, NfuOh 51 and OPI DS Original. The possibilities are endless really. You can use a huge variety of materials and methods and produce really unique designs. These proved to be quite popular as I have already sold quite a few. I even added a few to my etsy shop. What do you think of this? Exciting? Boring? 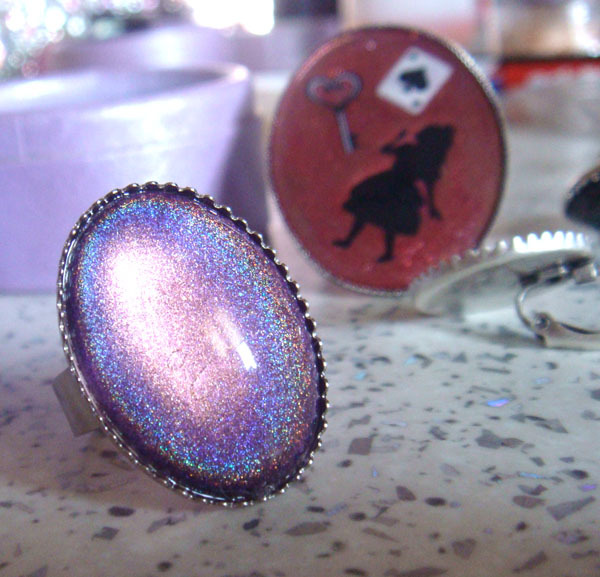 If you would like me to do my own tutorial on these rings let me know. Please do a tutorial on how you make them!! 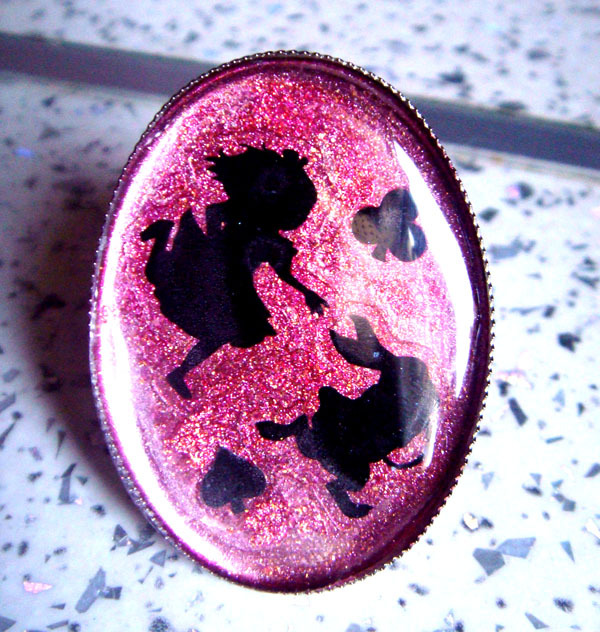 I love the Alice one and the one with the hibiscus flowers on! Of course we want a tutorial kaneloni! Καταπληκτική ιδέα και υπέροχα σχέδια! Μπράβο!!! wow!! please do a tutorial! where do you find these rings? the last ones that are not all plastic. @'chelle thank you dear. I wouldn't say talented as this was not my idea at all. 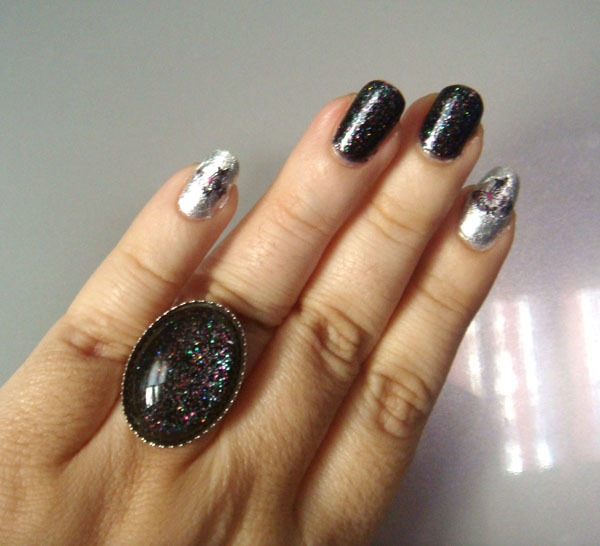 But I find it fun, being able to match your nails with your jewelery. I will make tutorials as soon as I find some time. I love every single one of them and I'll definitely try to make them, I hope I'll be at least half as successful as you were. @Katrina you totally should! With your awesome nail art skills I bet the results will be fabulous! @nataliedouka thank you! The rings can be found in places that sell jewelery supplies. Either online or in physical stores.